This winter dish is the perfect meal and will remind you of just how delicious and exciting vegetables can be. Remove the stems, wash, and chop the kale. Place in the blender, food processor, or Vitamix and add the rest of the ingredients. Pulse for 30 seconds, or until almost smooth. While the motor is running, pour in a few tablespoons of water so the mixture becomes a bit lighter. Transfer to a sealed container and set aside. Note: Pesto will last for up to ten days in the fridge and also freezes well. Preheat oven to 425°F. 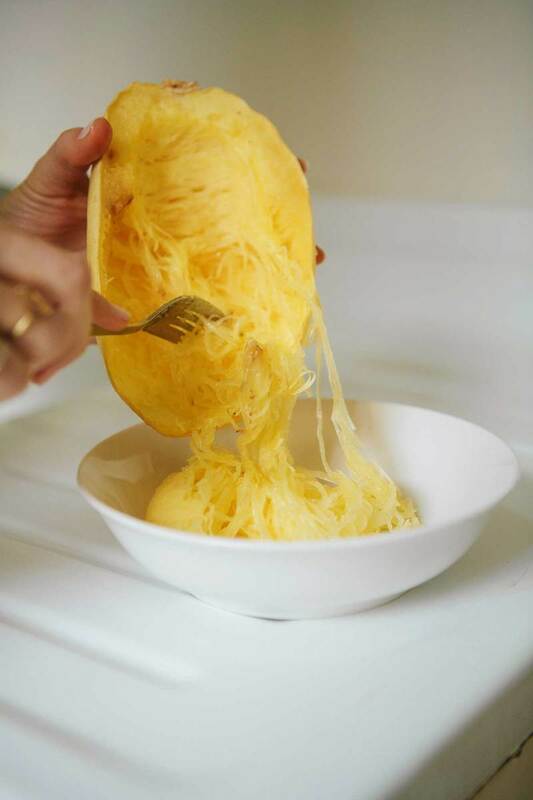 Cut the spaghetti squash in half and scoop out the seeds. Wrap each piece with aluminum foil and bake for 45 minutes, or until the meat is pierced easily with a fork. Let cool. Meanwhile, chop the broccolini into one to two-inch pieces and toss with olive oil, salt and red chili flakes. Place in a small baking dish and add to the oven. Roast for 10 to 12 minutes. Divide the mixed greens into two plates, drizzle of olive oil, and add another sprinkle of nutritional yeast. Scoop out the meat of the spaghetti squash and toss with Green Kale Pesto.